The spring season is now underway, and the racing has already been explosive and unpredictable! My season started with Het Nieuwsblad after a late call up after Coryn came down with a cold. With non-stop cobbles and climbs, this is quite a hectic way to start the season. Floortje showed her strength there to make it in a decisive move over the Muur, but the break was brought back before the finish, with only Chantal Blaak (Boels) holding off the charging peloton in an impressive solo move. We also can’t forget the famous race stop that made international news when almost caught the men’s peloton. I think the outrage was a little misplaced with this situation, and it was an honest mistake from the organizers who otherwise put on a great event. Considering the bigger picture, everyone saw this all play out on a livestream! The next day we raced around my old training grounds with Team Canada in the Belgian town of Tielt-Winge for Omloop van het Hageland. I was pleased to ride strong and sprint to third from a select group of riders for my first podium of the season! Just over a week ago we tackled the first Women’s World Tour race, and my favourite event of the whole season, Strade Bianche. My training partners know that I love a good adventure ride, and these rides usually involve gravel. We have a lot of gravel roads rather than cobbles in Canada. Strade Bianche is a yearlong excuse to train on these roads and justify my dirty bike. The race itself is just epic and beautiful, tackling some of the toughest gravel sections and climbs around Tuscany. There is always a worthy winner, as it takes grit and perseverance, along with smart tactics to come out on top. 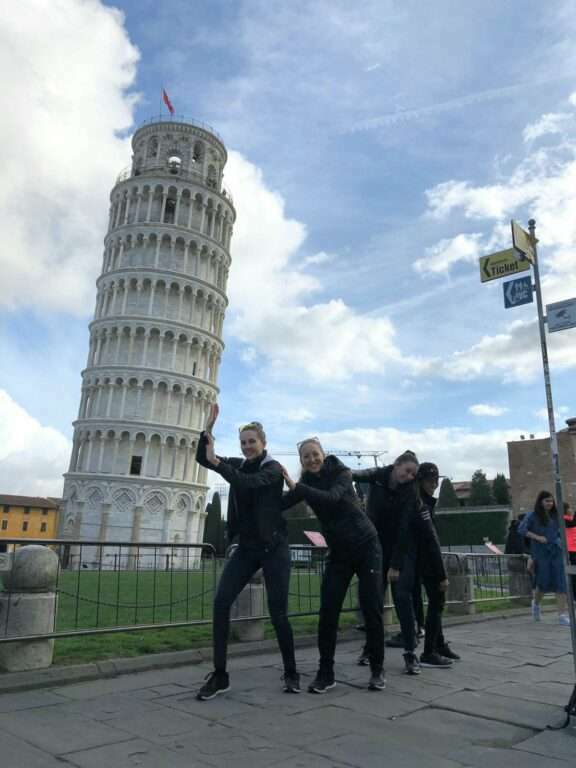 Before heading to Sienna, the team had our one tourist moment of the year in Pisa. Usually we travel, race, then leave a country without seeing or doing anything a typical tourist might do. I would rather experience a country by bike anyways and meet locals through racing, but it is also fun to occasionally play the tourist game. For Strade Bianche this year, we wanted to race dominant from the start, and decided to put the pressure on from some of the very first gravel sections. I suffered driving the pace with Coryn and my teammate Juliette. Lucinda put in a strong attack on the fifth and longest section, and then it was non-stop attacks and reshuffling until the end. My day was done at this point having given everything to set up the team and also suffering from a bit of a cold, so I tried to enjoy the rest of my ride through the Tuscan hills. Janneke was our top finisher in 8th at the end, not the result we were hoping for, but I am sure if we keep our fighting spirit, then the results will come! Time to get all that dust out of my ears and my lungs, kick this cold, and recover for the next races. In light of the heart-breaking recent news, I also just wanted to send my condolences to the friends, family and teammates of Kelly Catlin. We are all a big family in the cycling world, and her presence will be missed in the peloton. 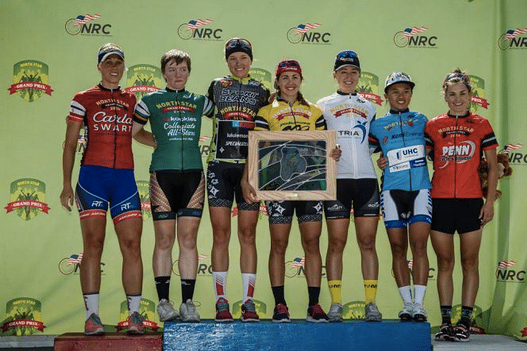 Kelly made a lasting impression on me when she rode as part of the Nature Valley Grand Prix Collegiate All-stars team in 2014 when I was there racing with Optum. She was new in the peloton, and just so strong, winning the best amateur jersey at the race. I also heard that this powerhouse rider was majoring in Biomedical Engineering and Chinese. It was clear that this smart and talented woman was going places! RIP Kelly, you will be missed.